These are the hard to track down Japanese Industrial Standard (JIS) Raised (oval) Countersunk screws used on many Japanese and European motorcycles. So hard in fact that I had them made in the Far East exclusively for MrMegapack. Various M5 and M6 lengths and pack sizes. These are BZP so match the original. You measure the entire length of countersunk screws. 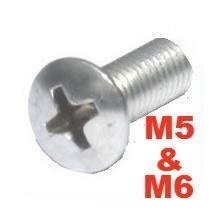 I have them in both M5 and M6 and various lengths between 12mm and 35mm. I also do them in A2 stainless. See my other listing.